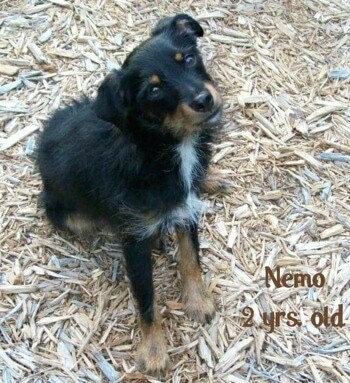 "Nemo is the sweetest little dog. He weighs 14 lbs. at about 2 years old. He doesn't chew on anything he's not supposed to. I can't think of one bad habit he has. He gets along well and plays with other dogs his size. He warns me of strangers and barks, but after a few visits he warms up to them. He sits, lies down, stays and barks on command." 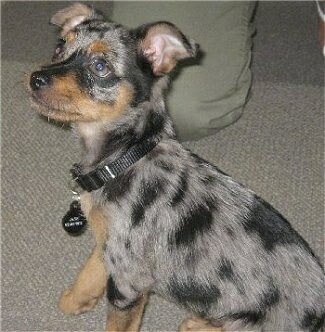 The Mini Australian Shepterrier is not a purebred dog. 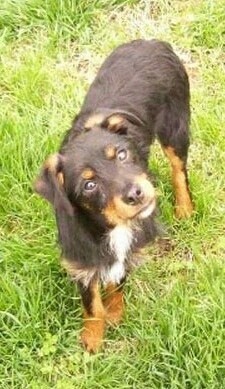 It is a cross between the Australian Terrier and the Miniature Australian Shepherd. The best way to determine the temperament of a mixed breed is to look up all breeds in the cross and know you can get any combination of any of the characteristics found in either breed. Not all of these designer hybrid dogs being bred are 50% purebred to 50% purebred. It is very common for breeders to breed multi-generation crosses. 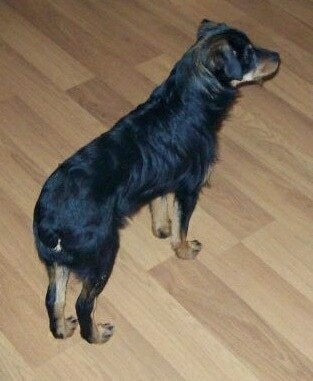 "Nemo the black tricolor Miniature Australian Shepterrier at about 2 years old. He is a hunter and fighter. He's caught and killed 2 possums in our backyard! It seemed to be natural to him. He likes the outdoors as well as liking the indoors. He's a hardy little dog that adapts well. Continuing to use Cesar Millan's techniques is producing a well-rounded and extremely happy little dog. I wish I had 5 more of him! It's funny, when I took this picture of him today—he's posing the same way he did when he was 5 1/2 months old in the picture below!" Nemo the black tricolor Miniature Australian Shepterrier at about 5 1/2 months old—"He is a cuddly little dog and weighs 9.4 lbs. He sleeps next to me at night and gets along with my cat (who outweighs him). I have seen them chasing each other. He hasn't had an accident in the house (yet…we adopted him 4 days ago) as I take him out often and praise him when he potties. When he starts to chew on something he shouldn't I use Cesar's technique making the "choo" sound. I'm a firm believer in Cesar's Way because it does work."